Chestnut Country Lodge near Kruger Park and the Panorama Route in scenic Mpumalanga offers visitors luxury accommodation and fine dining. 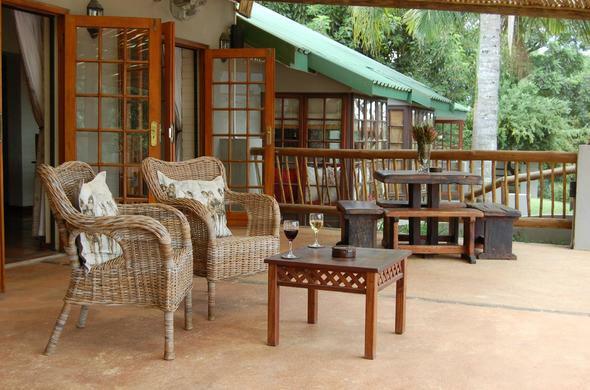 Chestnut Country Lodge is situated in the beautiful farming district of Kiepersol 10km from Hazyview in Mpumalanga and boasts magnificent mountain and valley views, together with luxury accommodation and fine dining. Set on 50 hectares of pristine indigenous bushland, Chestnut Country Lodge offers tastefully decorated en-suite bedrooms, each with own patio on which to enjoy the spectacular views. The world-famous Kruger National Park is the premier tourist attraction in this part of Mpumalanga and is easily accessed via Numbi and Phabeni Gates which are a mere 30 minute drive away or guests can enter into the Park at the main gate, Paul Kruger Gate which is approximately 54km from the Lodge. Morning, Afternoon, Full-day or night-safaris can be arranged (speak to your Siyabona Africa Destination Specialist). Skilled game rangers and trackers can show you some of South Africa's best game viewing. The Shangana Cultural Village located approximately 15km from the Lodge, is an ideal opportunity for foreign guests to experience local Shangaan Culture in an authentic village - the homes of the descendants of Chief Soshangana, villages of dignity and rich traditions look forward to welcoming you. Near Hoedspruit is the Hoedspruit Research and Breeding Centre for Endangered Species, well-known as the 'Cheetah Project' as well as Moholoholo Rehabilitation Centre for Endangered Birds. Both these projects are well worth a visit to witness the fabulous and dedicated work they are doing to protect the beloved wildlife. Chestnut Country Lodge is ideally situated to all the major scenic attractions of Mpumalanga, namely Blyde River Canyon, 3 Rondawels, Bourkes Luck Potholes, God's Window, the historic mining town of Pilgrims Rest as well as the various and beautiful waterfalls in and around Sabie that all form part of the Panorama Route.